I picked this one up at a library sale months ago because my son thought the pictures were funny. Only after I let my fingers do the Googling did I realize just how expansive this tubby pirate's lineage is. (I'm sure our more savvy Euro-readers are not so daft.) 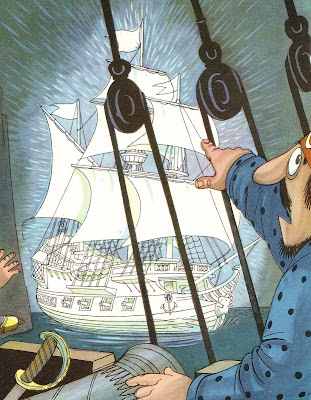 Created originally by Brit John Ryan as a comic strip, Captain Pugwash and his mates went on to star in countless books and cartoons in the 50s and on into the 90s. There's even a bit of naughty urban myth surrounding some of the characters names. Oh, how I love controversy in children's books. Delightful! This tale finds our fair Captain with a load of seemingly colorless paint with which to paint his ship, The Black Pig... at the same time, Cutthroat Jake (his worst enemy) is lurking around the corner waiting to sink the vessel. 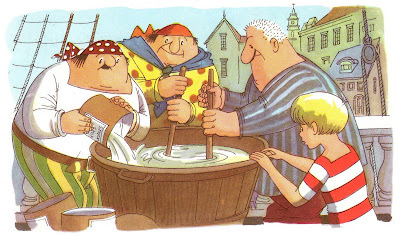 When the captain accidentally falls in the bucket of paint and becomes luminous, the pirates hatch a plan to scare the willies out of Cutthroat and his crew. ... "There's something coming, Cap'n Jake! Look! Look!" There, before the horrified gaze of the pirates appeared a strange and terrible sight. A ghostly ship gleaming in the darkness with a silvery light sailed slowly around the rocks and made straight for them. 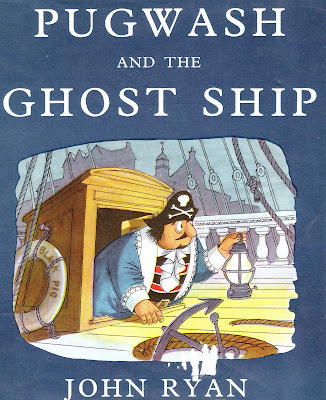 "That's not The Black Pig, it's a Ghost ship," cried one. 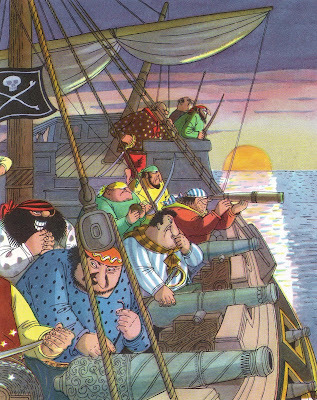 These rolypoly pirates are a riot to read about, and the illustrations are marvelous. The characters have great depth and color, sporting fabulous pinched faces, scruffy mugs and giant black-eyed pea eyes. Simply enchanting, and if you've a kid who's a pirate buff, I would think these titles to be a must-have. A good number of the Pugwash books seem to be in print in the US, but vintage copies are available all over. As for me, ARRRRR... I'll be keepin' me one eye out for the old salty dog in hopes of catchin' us some booty, yarr! Oh, this looks like great fun! I was at the bookstore today and came across a Herself the Elf from the early 1980s and thought about your blog and wondered if something that 'recent' fell in your realm of interest. I also came across a really cute old illustrated edition of Bambi by Felix Salten. I'm regretting not getting it! John Ryan is a British national treasure, and also looks a lot like Pugwash! Also drew 'Harris Tweed - special agent', a strip for the Eagle comic back in the 50's.